Laptop stands will save you from back pains. It’s not a secret that in 2018, most of us care about mobile technology than we have ever done before. Laptops are the most popular and most usable portable computers there are. But since laptops are getting more and more powerful, most people have opted to convert their very capable laptops into full work stations. While a decent laptop can comfortably handle a workstation or a desktop’s work load, you need to add some accessories to your setup to keep a healthy working environment. Laptops were designed to be portable computers used for light computing like checking and replying to emails, finishing up little work or consuming some media on the go. But used for long hours, laptops present a serious health risk to your back and neck. This is because when you’re using your laptop, you are almost never sitting in an ergonomic position. So it means an ergonomic sitting position is a proper sitting position when using your computer at home or at your work place. It’s important especially if you wor on your computer for long hours. A Proper Ergonomic Sitting Position. The best ergonomic sitting position when using a laptop should be upright, with your back and neck straight, your elbows should be at the same level as your desk or very slightly higher without being lifted. UCLA Ergonomics says you want the top of the screen to be a few inches above your eye level when you are seated. This is quite achievable with a desktop computer because the keyboard is already sitting on your desk while most monitors can be adjusted to the correct height. In fact, the fact that the keyboard and the screen are separate from each other makes everything easier. With a laptop, it’s impossible to be in an Ergonomic position using it. Mostly because the keyboard and the screen are together. Most of the time you’ll be either bending your neck or hunching forward. This might be okay for light usage but if your laptop is your daily work station, sooner or later, you’ll start to have back pains and neck pains. To avoid that morphine, you could make your laptop set up more ergonomic with laptop stands. The main advantage of a laptop stand is that it will raise your laptop’s screen to the recommended position. The top of your laptop screen should be one or two inches above your eye level when seated upright. Since this also raise your keyboard, you’ll need to purchase external keyboard and mouse; Bluetooth or otherwise. That will give you a proper Ergonomic position to work for many hours on your laptop without experiencing problems with your back or neck. You can make a simple DYI laptop stand with a bunch of books that you no longer use in your office or home. Stack them up until they can raise your laptop to the recommended height. Then add your keyboard and mouse to the set up. It’s not the neatest or the most professional set up you’ll ever see but it gets the job done. For better looking, professional and more user friendly laptop stands, you’ll have part with some money. Fortunately there is a wide variety of laptop stands on Amazon. Different people require different types of laptop stands depending on their needs. Some need sturdy laptop stands, some need portable laptop stands, some need professional looking laptop stands. 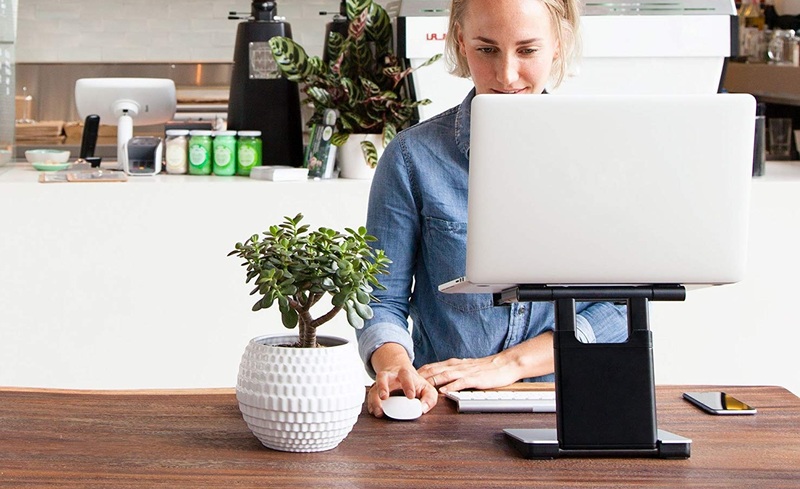 And for each category, there is a ‘Best laptop Stand‘ as described by Webpro Education. They also cost different prices but I don’t think any of them costs more than a back pain or a neck strain. Choose wisely and spend your money wisely. I am a technology enthusiast. I make high quality tech videos on YouTube and write content in my blog. I live for Technology everyday.